My Website Crashed. Some Very Valuable Lessons Learned. Two days ago I uploaded my first blog post, in what feels like 20 years. The name of the post is Be A Kid Again, Have Fun. Live Life. I sent an email to my entire list and asked them to read the post and leave a comment. I was super-excited to be blogging again because I love to write and want to have a great 1-2 punch between my blog and motivational podcast. And then my site went down. Faster than a 50lb cement block dropped from a skyscraper, it was gone. No sooner did I send the email to my list, did I begin receiving replies back that the linkÂ was dead, “your site is down”, etc. People were sending me messages on Twitter saying the same things. If you’ve been online for any length of time, this stuff will happen.Â Nonetheless, this was 100% my fault because I never paid any attention to the security of my site. Even the most basic thing like changing the login username and password – I never did that. My login credentials have been the same since my site was overhauled earlier this year. Truth be told, had I not made some wholesale design changes, I wouldn’t have even had THAT new login information. There’s lots of lessons to this tragic story. Actually, it wasn’t that tragic at all but I wanted to add some drama to the story. In a nutshell, here’s how it all went down (no pun intended). 2. I send a tweet to @HostGator, which is my hosting service, letting them know my site has crashed. Why did I reach out to my hosting company via Twitter? Why not pick up the phone and call, or submit a ticket online? I reached out to them on Twitter because I didn’t want to wait on hold, or type out a long support ticket online, trying to explain my situation. I simply sent a brief tweet and Hostgator Support got back to me within minutes. Next , they sent me an email update within an hour, letting me know this was all my fault and I’m basically an idiot for letting this happen. And you know what? They were correct. As I said before, I should have put way more security into my site. I use it for a number of things: Sports, news articles, blogs and communicating with my podcast listeners just to name a few. If you’re not following me on Twitter, be sure to do so here @SamCrowley. Say “Hi” and I’ll tweet you back. And if you don’t use Twitter in your business, start doing so today. It’s by far the best source for fast information and communication with people from all walks of life. Think of it as text messaging your favorite thought leaders without having to use a phone. 3. I shoot an email to my buddy Phil on July 4th. Phil was the one who redesigned my website a couple months ago. He was leaving for a mission trip with his family the next day and it also happened to be a holiday here in the US. Nonetheless, Phil replied right back to me and said he would try and fix the site. We weren’t using any backup plugins, so any old files we had, Phil would have to find them on his computer. Thankfully, we just finished the new design, so he had them nearby and even better- Phil had my site back up and running within an hour. Another awesome thing happened, which also involves social media. I posted my site-crashing sob story on Facebook. Immediately, many people began responding with some great suggestions on how to retrieve the files and more importantly, how to avoid this from happening again. As you can see, I wanted to spin the event as ‘no big deal’ especially after the super-challenging week I just had with our family. Meaning, if it didn’t involve my family or my health – it really isn’t that big of a deal. 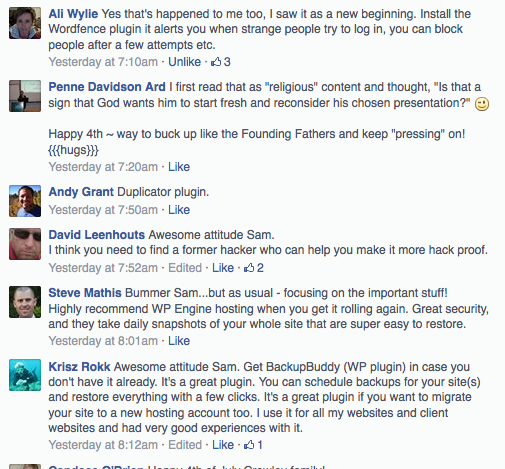 Then I received a bunch of great comments on the thread with suggestions on how to back up my site. This is social media at its best. People offering helpful suggestions to someone – not for money, not with some spammy affiliate link. They’re commenting on the post just because they want to help. 4. My site was back up and running within 24 hours. I’m no techie, nor do I claim to be. I know enough to navigate online just because I’ve been running my own online business for some nine years. I can launch web pages, integrate merchant accounts and optin forms – all the basic stuff most online entrepreneurs can do. It comes in quite handy but you’ll never find me on Odesk looking for webmaster work. What I’m good at is surrounding myself with some very talented people. Not just any kid of people, either. These are super nice folks who have a passion for what they do and are not looking at me with a dollar sign on my forehead. If you can just find the right people for your inner circle, you have most of this business stuff figured out. You don’t need to have all the answers. Heck, you don’t even need to know the best questions to ask. You simply need to build a Rolodex of people who care. With that said, it’s not the easiest thing in the world to do when first beginning an online business. Had this situation happened to me when I first came online in 2005, I would have no clue where to go for help and probably would have paid 10X more and also waited a week, just to get my site back up and running. For example, when you’re building your business, use social media to find the people who are very good at what they do AND care about their output. Ask questions on Twitter and Facebook. Find out who and where the good people are, then reach out to them. Social media isn’t always about self-promotion and selling. Social media can be used as an incredible networking tool for genuine people who want to connect with and help each other. What started out as a not-so-great day, ended with a pretty drama free experience. A happy ending in less than 24 hours. Like any adversity: We learn from it. Move on. And try to improve. 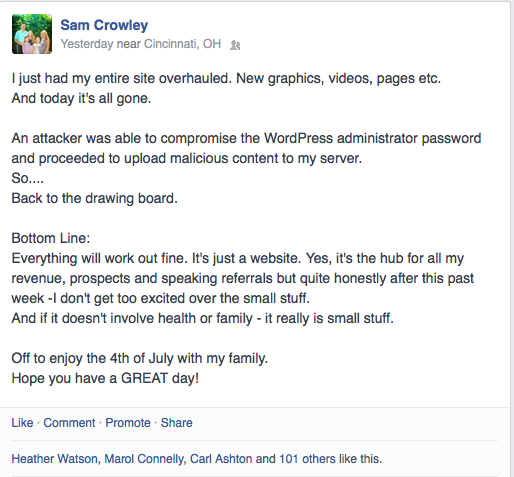 Thanks for sharing your story, Sam, and for including how the site was back up and running. I particularly like your lessons learned. Hi Sam, Thanks for the story. As you know I’ve been in the process of building a blogging website the couple of months as well. I’m not in the public eye as much as you so security has been very low on my priority list. Based on your experience I’m thinking I should change my thinking on this subject. I’ve also had some issues where I thought my only way to communicate was by phone. I never considered using social media. Those 30min waits on the phone would have been much less stressful. Thank you for your insights. I was pleasantly surprised at the fast response from a simple tweet to my hosting company. They replied via email, then stayed in touch until we had a resolution. Much better than waiting on hold, explaining everything…..that’s a time vampire.